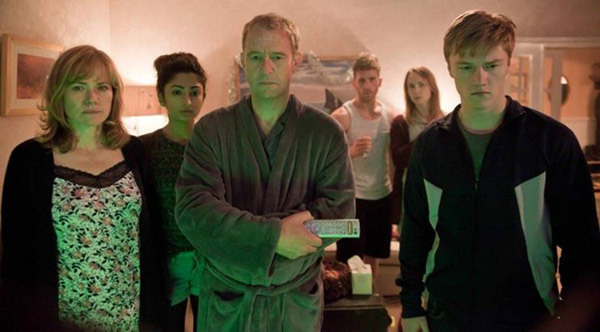 What was it about Gavin Williams’s script for AWAIT FURTHER INSTRUCTIONS you liked so much, and what did you add to make it more personal to you? Well, when I first read the script I thought: “How the hell am I going to make this!” It was like nothing I had ever seen before. I knew it was going to be a massive challenge in every way possible. Overall, this was a very unusual script and that also appealed to me. My main addition to the script was to push it in a much darker and serious tone overall, which is more my style of filmmaking. I’m pleased that I managed to retain the dark humour at the start but then move into a different and much more serious realm as things start getting nastier for the family. GOD’S OWN COUNTRY producer Jack Tarling thought of you as director because the script is a solid character study in the same vein as your previous film THE DISAPPEARED. Can you see the similarities? Yes, in some instances (apart from the VFX) there are lots of similarities to THE DISAPPEARED. For instance we are seeing our characters break down in front of us and observing how they subtly start to transform into someone else. Ultimately it’s all about characters for me when I make a film, if I don’t have a script which doesn’t have interesting or dynamic characters then its not something I’m interested in doing. It’s extraordinary how the film’s subject matter has chimed with the current hot issues of misplaced authority and fake news? The timing is pretty unbelievable, considering the script was written a few years ago! It’s really hit a raw nerve with the American audiences when screening it at Chicago. They are pretty much seeing what’s going on in the world played out in front of them. The family in my film are people who simply don’t know what’s real and what’s not in the news anymore! 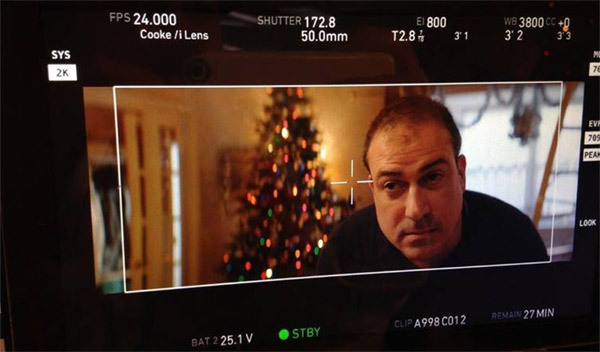 Was it always a Christmas setting and what did that add to the horrific atmosphere? Yes. Families tend to always argue when they get together over Christmas, it seems to generally bring out the worst in people. Now imagine locking those families together in one house and then dousing them with fear and paranoia. You’re left with the most extreme and horrible scenario imaginable, which is what AFI shows us. There’s a definite David Cronenberg/John Carpenter vibe going on, how did you ensure to strike the right balance between homage and innovation? Yes there are influences by such films as ‘The Thing’ and in particular ‘The Fly’ by Cronenberg, with the whole body horror elements. I was also very influenced by Hitchcock’s ‘The Birds’ as well as ‘The Twilight Zone’ episodes and 50’s paranoid sci fi films. Seven people in one enclosed place like CUBE and the ensemble cast is amazing. Did the rehearsal period you insisted on before shooting engender that family-style cohesion? Yes that was definitely a challenge for sure. Again, you want to be able to manage seven characters speaking at the same time but still keeping it as exciting and dynamic as possible. I was fortunate enough to be able to rehearse with the actors on the actual built sets, which really help with blocking and being able to play around with different ways to shoot it and for the actors to feel comfortable. Dan Martin’s special prosthetic effects are wonderful. How important was it for you to do as much in camera as possible? I had never met Dan before the film but I knew his wife Jen Handorf who introduced me to him and that’s how he became involved. The film uses old school SPFX techniques, prosthetics, animatronics, wires, puppeteers, shooting in reverse etc. and finding someone these days who specialises in these is hard. Fortunately, Dan is one of them. I presented Dan with a bunch of concept art, which I had worked on with my Creature Designer Steve Trumble and Dan immediately got the concept. It was then a matter of making them work, which he did! How difficult is filming on interconnecting sets in one locked location? Can you say something about Annika Summerson’s terrific lighting, how would you define the look? Again I wanted it to look cinematic, rich and by her lighting style she achieves that excellently. By the second or third act in particular we played with colour a lot. Annika used a colour chart to map out the lighting colour changes throughout the film, For example, as we start to push the claustrophobia element then the house starts to darken and the dominant light source is the TV. At the movie’s centre is an amusing concept regarding television’s last power push in this age of multi-visual platforms. But you play it completely straight. Was keeping the humour in check hard? I think the humour is there at the start but then it dies away as things start to get more serious. Yes, there is a challenge making this insane scenario as serious and feeling as real as possible. There was always a danger it could go the wrong way regarding tone. So by really going for a dark tone and by the serious way the actors play their parts does definitely help that! 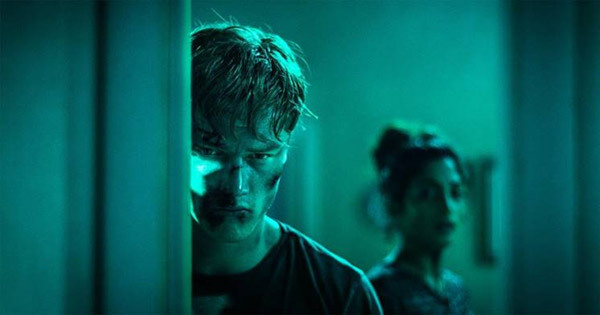 AWAIT FURTHER INSTRUCTIONS plays at Arrow Video FrightFest, Prince Charles Cinema on Sun 26 August.